I am thankful for safe arrival yesterday at Istanbul, meeting up with Ferrell Jenkins who had just concluded a tour in Turkey. Today we crossed the Sea of Marmara by ferry to save driving time on our way to Nicaea, called Iznik today. Nicaea was one of the important cities in New Testament times in the Roman Province of Bithynia. Peter addressed Christians over a widely scattered area (covering much of what is the country of Turkey today): “Peter, an apostle of Jesus Christ, To the pilgrims of the Dispersion in Pontus, Galatia, Cappadocia, Asia, and Bithynia” (1 Pet. 1:1). Dr. Mark Wilson writes that Nicaea “vied with Nicomedia for the distinction of being the principle city of Bithynia” (Biblical Turkey: A Guide to the Jewish and Christian Sites of Asia Minor, p.369). It was a great opportunity to be in Nicaea today. The weather was very pleasant, and the lighting was excellent for most of the photos we made. Plus it’s just great to be in what was biblical Bithynia. The gospel made inroads there, as evidenced from 1 Peter (most conservative scholars believe that Peter’s second letter was written to the same audience). That means it was highly likely that the messenger with Peter’s letter would have contacted brethren there. Dr. Wilson says it a bit more emphatically, “. . . the messenger caring 1 Peter would certainly have visited Nicaea” p.370). Nicaea is characterized by an ancient city plan which makes use of the decumanus maximus running east and west and the cardo maximus north and south. Nicaea was a walled city with four gates. Wilson says of the walls and gates that they are the most unique in western Turkey” (v.371). The Roman walls were built on Hellenistic walls, but the Roman walls then were reconstructed by the Goths after the Goths destroyed them (AD 268-270). In AD 325 the first of the Ecumenical Councils (as well as the seventh) were held in Nicaea. It has been long-standing to date church history as pre-Nicaean and post-Nicaean. Nicaea is situated on the east side of a beautiful lake which had commercial importance. We drove along side of it at times en route to Nicaea. This city was established under the Greek rule during the intertestamental period, 316 BC). So Bithyna for sure and Nicaea almost certainly was important to the church in the first century, and Nicaea became very important in church history for time to come. Tonight we share a photo of Nicaea’s east gate. 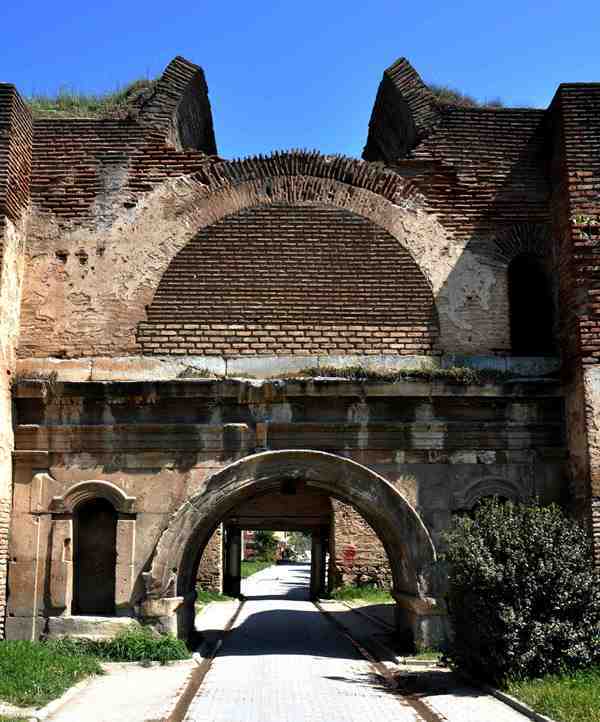 Nicaea East Gate. Photo ©Leon Mauldin. Neither Mr. Jenkins nor I had been to Nicaea before today. We agreed it was really a good day. We got to the ferry with 5 minutes to spare. Tomorrow we are to fly east to Gaziantep and see such sites as Zeugma and Haran. Haran, today spelled Harran, was Abraham’s home for a time, at of family that are prominent in the biblical Narrative. This entry was posted on Wednesday, May 21st, 2014 at 2:49 PM and is filed under Bible History and Geography, Bible Study, New Testament, photography, Roman Empire, Travel, Turkey. You can follow any responses to this entry through the RSS 2.0 feed. You can leave a response, or trackback from your own site.